Allnigeriasoccer.com understands that promising Nigerian defender Jubril Okedina could bid farewell to Tottenham Hotspur at the end of the 2018-2019 campaign. Okedina is still waiting to find out what Tottenham want to do with him but it's likely he will leave as he comes off contract with the North London club in June. Should the 18-year-old depart Spurs, he won't be lacking suitors as his advisers have held preliminary talks with a number of Premier League and Championship clubs. Crystal Palace, Swansea City and Ipswich Town are among the teams that have expressed an interest in his services. 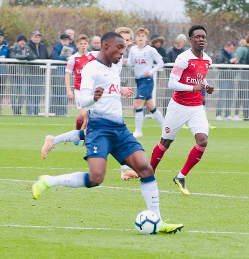 Born in London, Okedina penned a scholarship deal with Tottenham ahead of the 2017-2018 season and has made 14 appearances in total in the U18 Premier League in the last two years despite missing almost the whole of last season due to injury. He made his debut in the UEFA Youth League and Premier League 2 this season.